UFOS Observando o pouso da Apollo 11? Neil Armstrong, o primeiro homem a pisar na lua morreu de insuficiência cardíaca. Para muitos, Armstrong é o herói americano que realizou o aparentemente impossível. Ele cumpriu a visão do presidente Kennedy de colocar um homem na Lua antes do final da década. Caminhada de Armstrong na lua foi televisionada e testemunhado por centenas de milhões em todo o planeta. Para muitos, foi uma experiência inesquecível e despertou as esperanças de um futuro brilhante para a viagem espacial humana. O que Armstrong experimentado naquele dia na lua foi marcada pela controvérsia sobre um período de dois minutos de silêncio de rádio que os telespectadores surpresos e alimentados muitas teorias sobre o que realmente aconteceu. De acordo com alegados documentos do governo que vazaram e fotografias, Armstrong não apenas ver a paisagem árida televisionado para milhões, mas algo muito mais significativo. De acordo com membros da NASA e um suposto presunto de rádio transmissão de interceptação, o que Armstrong testemunhou naquele dia mudou sua vida, e levou à eventual abandono das missões tripuladas lunares. De acordo com alegados documentos vazados, duas naves extraterrestre enorme assistiram ao pouso da Apollo 11, e observado o Armstrong e Buzz Aldrin caminhadas lunares. O que é? Controle da Missão chamando Apollo 11. Terian sido os dois minutos de silêncio de rádio durante o pouso da Apollo 11 na Lua, uma tentativa da NASA de encobrir o que realmente Armstrong viu na lua? Avistamentos de OVNIs eram uma ocorrência comum durante as missões Apollo? De acordo com Buzz Aldrin em uma série de entrevistas com a imprensa, a Apollo 11 foi de fato observada por um OVNI durante a sua viagem para a lua. Aldrin descreve como os astronautas da Apollo 11, evitando mencionar a palavra UFO em relatar o que eles estavam testemunhando, e em vez perguntou Houston sobre a localização do foguete Saturno V lançamento. Admissão de que Aldrin Apollo 11 foi sendo sombreado por um OVNI dá credibilidade à crença de que os OVNIs testemunharam o pouso na Lua, Armstrong relatou isso para a NASA em uma comunicação de rádio, que resultou na inclusão de dois minutos de silêncio de rádio. Aldrin também apóia a reivindicação de Chatelain, de que um ou mais veículos extraterrestres assistiram ao pouso da Apollo 11 na Lua como Chatelain afirmou em seu livro. Professor: O que realmente aconteceu lá fora com a Apollo 11? Armstrong: Foi incrível … claro, nós sempre soubemos que havia uma possibilidade … o fato é que fomos alertados. Nunca houve qualquer dúvida depois de uma estação espacial ou uma cidade lunar. Professor: O que quer dizer “alertados”? Armstrong: Não posso entrar em detalhes, exceto para dizer que suas naves eram muito superiores às nossas, tanto em tamanho e tecnologia – Rapaz, eram grandes! Ameaçadoras … e …. Não, não há nenhuma questão de uma estação espacial. Professor: Mas a NASA teve outras missões após a Apollo 11? Black Ops NASA Técnico: Nós não estamos sozinhos, afinal, somos nós? Buzz Aldrin: Não, senhor. Nós não estamos sozinhos. Se os eventos acima são verdadeiros, deve ter sido muito difícil para Armstrong para manter silêncio oficial sobre o que ele realmente viu na Lua há mais de quatro décadas. Talvez isso explique a sua natureza reclusa após as missões lunares, e reticência do público ao descrever suas experiências pessoais na lua. Se for assim, ele permaneceu fiel à sua palavra e em silêncio, apesar de quaisquer reservas pessoais em contrário. Neil Armstrong foi um patriota americano até o fim. On October 24th, 1991, documents were provided to former Soviet cosmonaut Pavel Popovich, the then President of the All-Union Ufological Association in Russia. These files contained copies of UFO reports sent to the infamous KGB. 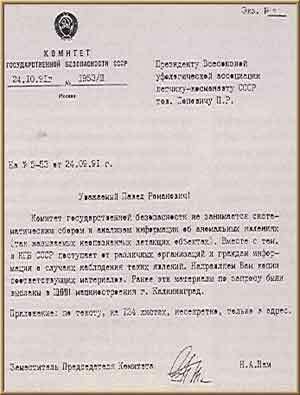 An accompanying letter was written by the Deputy Chairman of the Committee for State Security USSR, N.A. Sham. The files consisted of handwritten reports, typed testimonies, notes from KGB informers, crude drawings and eyewitness reports of UFOs. 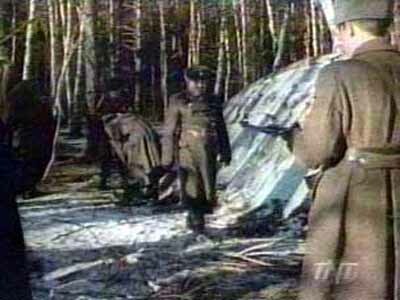 This cooperation between UFO researchers and the KGB was unprecedented and was a landmark in UFO research in the Soviet Union and possibly the world. Sixteen years later we have managed to catch up with the now former Deputy Commander of the KGB, and published here for the first time is an interview with the man himself. In June 2007 I was asked for an interview by NTV. NTV is one of the largest TV companies in Russia. Apparently they were making a new UFO documentary and wanted to discuss with me my research into the Alien Autopsy film and the book I had co-authored with Paul Stonehill (Mysterious Sky-Soviet UFO Phenomenon). The journalist Alexey Egorov along with his cameraman and translator Elena Volkovaya duly arrived and the interview took place at my home in West Yorkshire. 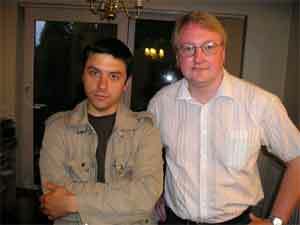 After the interview we discussed many things and Alexey informed me that he had interviewed the former Deputy Chairman of the KGB Nikolay Sham, and discussed with him their release of official KGB UFO files to Russian UFO researchers. This is covered in our book Mysterious Sky. Alexey went on to say that he could provide me with a transcript of his interview with Nikolay Sham. This duly arrived via email and was quickly translated by my colleague Paul Stonehill. Nothing has been omitted from the following interview, although Paul Stonehill has inserted a few things in brackets for clarification purposes only. The full interview is reproduced here with kind permission of NTV in Moscow. economic espionage against other nations was generated). He left the KGB in 1992, because of health reasons. In 1999 he headed a private corporation, Greenmaster, involved in the production of various devices using technologies of the defense industry. Later he was the General Director of First Leasing Company (2003). He is mentioned in Russian media in connection with paranormal phenomena. 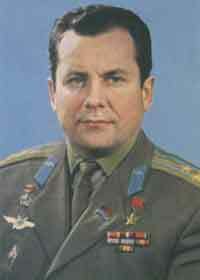 The former KGB Major-General, Nikolay Sham, who for a time served as a KGB deputy chairman, had turned over to cosmonaut Popovich a 127-page record of anomalous events observed on the territory of the former Soviet Union and in the Russian Federation. The details of a Russian Crash on or about 1969 are sketchy and somewhat suspect. This case comes from the so-called “Secret KGB Files,” which were reportedly smuggled out of the former Soviet Union. The show featured extraordinary film and still photographs of the UFO recovery, and also a portion of autopsy film on part of an alien body. The event itself, according to the files, occurred in the state of Sverdlovsky, which was formerly Yekatrinburg of the USSR. The crash story follows a familiar pattern normally associated with this type of report. 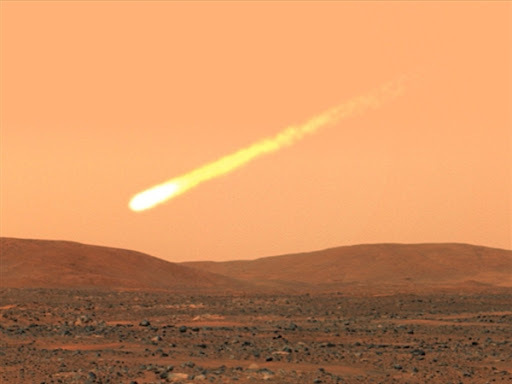 The fiery crash of an unknown object occurred in March 1969. The site was secured by the Russian military, and one dead alien was found in the wreckage. The remains of the craft and alien were brought to a secure location, and the alien body was autopsied. Both still and moving pictures were taken of the craft, its retrieval, and the alien autopsy. The autopsy shows only an alien torso and arm. From the size of the body parts, the alien would have been an extremely small being. The TNT special features Roger Moore, veteran actor and former James Bond, who discusses other UFO events, along with interviews with UFO experts, CIA agents, and other film. 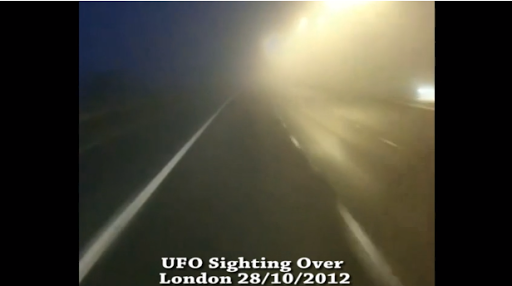 Probably the most notable footage is from MIG gun cameras of confrontations with UFOs. 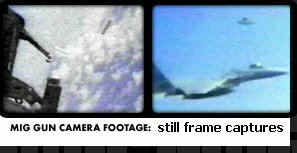 There have been only a few still frames of this footage in America, and I have not been able as of this writing, 11-01-2002, to obtain the videos. The show itself is mediocre, and its only redeeming quality is the presentation of the UFO crash story. Supposedly, the crash story was validated by secret KGB documents. The footage at the crash site does seem to be authentic at least on several points. The truck in the film is a circa 1950 model ZIS151, which has not been used by the military for quite some time, and the truck would have been difficult to find to stage a hoax with. 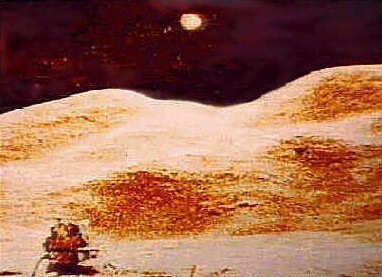 Other elements of the film do not exhibit any obvious signs of a hoax, as to the movement of the soldiers, the timing of the film as to shadows, and the UFO itself. There are also several documents shown to verify the event itself, and an eyewitness to the event who swears that the recovery mission did occur. The footage of the autopsy film shows personnel without caps and gowns, which seemed odd to me at first, but after some research I found that this was commonplace for that era in Russia. The furnishings in the room are acceptable, and in Russia have probably not changed much today. Three men in their 20’s and 30’s are performing the procedure, and one woman is taking notes. The note taker is identified as KGB stenographer O. A. Pshonikina. The alien’s torso and arm are lying together on the table as the autopsy is performed, and there are documents shown to support the autopsy. Although the USA-Russia relationship is much improved over a few years ago, it still lacks. Any information received is subject to translation, and often times there are problems with interpretation. It is sad there is not more cooperation between the two countries. The case of the 1969 retrieval and autopsy are difficult to assess. Until more information is uncovered, it will remain unsubstantiated. NAS: “It was in ’91; the document’s registration indicates so, that is why the year was ’91. NAS: “Quite right. I simply (unclear-P.S.) story, why the accumulation of these documents took place specifically in the KGB. There was a special decree of the Government and the Central Committee of the Communist Party of the Soviet Union about the commencement of the research of these phenomena that occur in nature. According to this decree all law enforcement agencies (KGB, Ministry of Defense, Ministry of Interior Affairs, and the border guards) had to inform and report to the Center about facts they had been receiving regarding all such phenomena in nature. And all the agencies had factually accumulated the information. But the KGB was not engaged in research of such issues; it is just that some administration, some special department, if they would get some eyewitnesses of all that was happening in the atmosphere… they would take explanations and mostly hand-written materials that were sent there, describing how they saw (phenomena-P.S. ), what they felt during (sightings-P.S. ); describing the background of the event, and so on. All that we had eventually accumulated…accumulated, and by the same decree a few academic institutes were obliged to undertake (measures-P.S.) in order to research all these effects, various phenomena, and come to some conclusion of every incident. The main institute in the Academy of Sciences selected and appointed (to head the research-P.S.) was the Institute of Space Studies. All interesting facts were always addressed. Experts, scientists left for the place of the incident, asked questions, took soil samples, took various measurements, and so on; and reached some conclusion based on the results of the event or a fact (that was being researched-P.S.). This work was conducted for several years, and some time in mid ’85-’86, in that area, it was completed, this work…and produced was a report about all the events that were registered through a number of years over the territory of the Soviet Union. I remember that report; I held it in my hands. 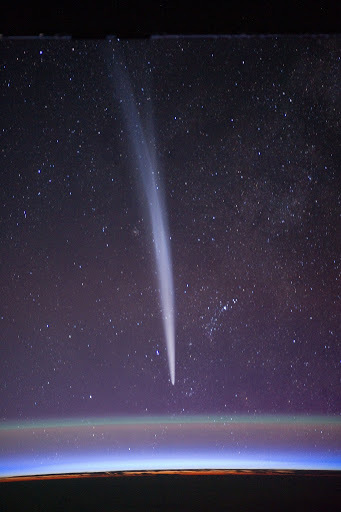 Of course, I do not remember all of the details there, but from what I remember now, up to 70 percent of all phenomena that were somehow registered had been explained”. NAS: “Well, 30 percent…of those 30 percent, half were explained; not just one explanation, but variations of: it could be explained this way, or that way. But not in the sense that again, (it was-P.S.) some extraterrestrial civilization, its manifestation, and so on. No. And some 10-15 percent could not be explained at all…what it was, what effects, manifestations, what kind of phenomena occurred in nature, atmosphere, and so on”. AE: “Do you remember any examples of what could not be explained”? 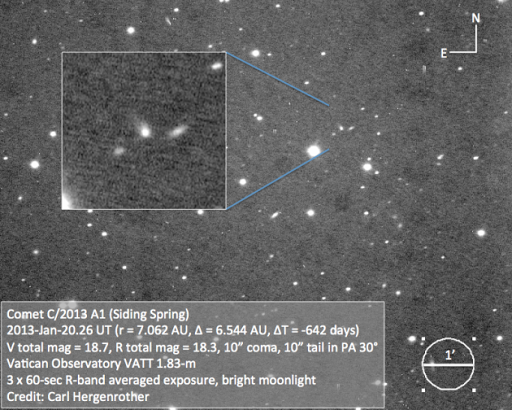 NAS: “Mostly it…things that could not be explained, when some object materialized. Observed was a materialized object, mostly they were spots, some luminescent points, something else of different configurations and so on. As for materialized objects, that truly, if they were photographed, they had a materialized background in the shape of a saucer, some cylinder, or something similar. All such things, of course, could not have been explained: what it was, how one can comprehend all of it. That is what I remember from everything that took place back then. Moreover, all these sharp increases in public interest, they take place periodically. Time after time, the same question…you are fifth or sixth party that come with the same question. Also, from the West I was approached, why? Because these materials; this digest, travel all over the world”. AE: “All comes from this letter, because after this letter, the KGB secret files were sent to ufologists”. NAS: “No, there was not any secret document”. NAS: “And I want to address this point…how one can explain such things. Here, based on the results of the work that is being performed here in Russia. What is the heart of the problem? If we imagine this Earth where we live-it is constantly subjected to the effects of the external environment. In fact, we have…we have gravitational fields. Further…we have the Sun, and gigantic energy of the Sun comes to the Earth. Correct? Then, we have heavy planets, we have galaxy, we have so-called “relic radiation”; we have a tremendous amount of electromagnetic fields with different frequencies, and so on. And human being, it is also such a being that has everything moving inside, shifts. You know, there is some aura around a human being; a human being emits some radiation, and so forth and so forth. As a principle, one cannot exclude that in conjunction with certain factors and creation of certain fields, with manifestation of certain electromagnetic fields with certain frequencies there comes some influence on human beings. And results of these studies demonstrate, really definitely and truly demonstrate, that a human being, entering into the area of influence of such natural phenomena…he starts changing, this human being. That is, in principle, he comes to the point where he ceases to comprehend. That is, entering into the field, into this zone, that can continue for dozens of minutes… he becomes inadequate, this human being”. NAS: “Quite so …in the mind of the human being affected by all that, it can (be a hallucination-P.S. ), on one hand. On the other hand, because the Earth, too, is not of one origin, that is, there are so-called break-up lines. What is the break-up line? To speak figuratively, it is electrolyte. In the fissure, there is electrolyte. And as this is electrolyte, and imagine, there is some movement of this firmness, naturally it comes (movement-P.S. ), currents are registered, and the mechanism…of the equipment in the cables registers currents up to 27 amperes! AE: Can you imagine the power that comes as a result of these waves, radiation that comes from the very Earth? NAS: “Also, there was some interest two-three years ago in the same subject, in this file. I offered them to just meet, I know some ufologists, I offered to meet them in order to…and I organized this meeting; I do not know what happened after that, but I did previously speak with these comrades on the subject of all these documents. And they said, generally, with regret, with resentment, they told me that all of the materials that had been accumulated in the institutes and so on, it did, to say figuratively, left Russia. NAS: “In fact…with such (great-P.S.) resentment I was told of all these things. Indeed, some unscrupulous people used the situation, the lawlessness and uncertainty that exist in the country, and tried to make business out of it. And in fact, these materials left the country”. AE: “I can give this example. The letter was addressed to Pavel Popovich. Three days ago we posed a question to Popovich, and he said: let me go through this file, I want to understand, what is there, because he (Popovich-P.S.) did not see. NAS: “Firstly, I know absolutely nothing about this. This is the first thing. I can only comment that in the Soviet Union during the period of, so to say, blooming of the rocket-space system industry here, every year more than 100 satellites of various types had been launched. We had that main spacecraft that is still with us, the piloted Soyuz craft, and its descending capsule. At the same time, our other organizations developed completely different systems, including (those for-P.S.) evacuation of the crew, and landings. These systems had been tested, and really they were in their essence, unique, these systems. It seems to me, one of the emergency breakdown situations connected to the experimental work to develop these systems, is depicted in this film. This is most likely. Usually, when there was an emergency breakdown situation, naturally, the site would be sealed off, and experts would arrive there. In principle, all these developments were conducted in the interests of the Ministry of Defense, interests of the Armed Forces. They were not the only developments; they were done in the interests of the Ministry of Defense. AE: “If this here autopsy took place, would you be informed?” (Most likely TNT TV show The Secret KGB Files broadcast in the USA in l998). NAS: “From September ’91 I was Deputy Chairman of KGB and remained at that position until June of ’92. And, then left because of health reasons”. NAS: “That subject of UFO appeared in mid ’70s. 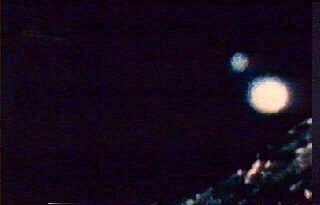 I already mentioned…From mid-’70s there was a sharp increase, related to these unidentified flying objects. There was a resolution of the government and Central Committee of the Communist Party of the Soviet Union to conduct related projects to bring clarity to these phenomena that took place in the country. This resolution was made, and all law enforcement agencies-Ministry of defense, KGB, Ministry of Interior Affairs-were obliged to receive information from citizens regarding such events and send this information to the center. Thus, this system was created, worked out, and from all the corners of the nation, wherever something happened, related to such events and phenomena, all this came to us, to the Center. And from the Academy side, several institutes were obliged to conduct research of the phenomena that were registered on Earth. The Institute for Space Studies was designated to be the main one. And for several years this work had been conducted; it was completed some time in mid ’80s; a report, a fundamental report was produced, where, generally, all collected matters, related to the events in this or that corner of the country, all were put on shelves, systemized, materials were related to every (appropriate-P.S.) event, location of the event, time of the event, what eyewitnesses, what did they observe, what did they feel at the time, what effects and what shape the thing had-all this was systemized; they even made tabular shapes, shapes and silhouettes (outlines-P.S.) of UFOs that had appeared in the atmosphere. In most cases, experts went to the most interesting sites. Performed appropriate measurements, conducted questioning of eyewitnesses, and conducted various researches of sorts, and so on. And as a result some conclusion was made for every event. I remember, around seventy percent of the events were provided with real and objective explanations. What were they connected with? 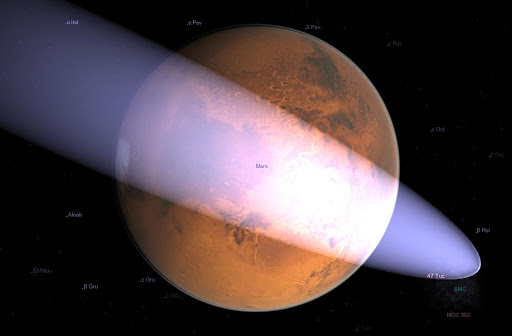 Tests of aviation technology, missile technology, launches of space objects, parts of spacecraft objects falling into the atmosphere, aircraft technology disasters, some cataclysms in nature connected with something being discarded and so on. That is, everywhere they found an explanation. But in thirty percent of cases, it is as if half of an explanation was given, but not a single one, meaning that yes, something took place, but facts that certainly confirm what is, are not sufficient. And in some instances, simply due to lack of information and due to dearth of any material proof at the incident site, no conclusions were made. The annual report was completed somewhere in mid ’80s. The KGB itself, naturally, did not research these issues; we did not have such direction. There simply was collection, gathering; and periodically the materials, as they say, were dumped into the Institute of Space Studies or other departments, depending again on the contents of an event, as they say. That is what took place”. NAS: “I do not know why it was exactly Setka AN. I cannot say. That did not interest us; what was interesting was why? Because…As a matter of principle, all these things, (unclear)… that take place in the atmosphere, and that assume such various forms, all this, generally, first of all are connected with, of course, power engineering, with electromagnetic fields, with massive radiation that surround us. This radiation…just the enumeration, as they say, God knows how much there is, starting with…(unclear)…was given a Noble Prize for discovering this relic radiation. These scientists had discovered first, launching a specialized satellite, and see how the Americans had developed that topic, and received a Noble Prize for it. And our program was terminated, did not get to be developed. You don’t have to be Einstein to see that Sham is still a little guarded all these years later. It is nonetheless interesting to note that he readily admits that a large percentage of things did remain unidentified and he did clarify what western researchers had speculated about for years, the fact that the Soviets used UFO stories to mask weapons testing. The reason for this is that they were breaking a number of international treaties at the time. Space here does not allow a more in-depth look at the KGB UFO files but they are covered extensively in the book I co-authored with Paul Stonehill. 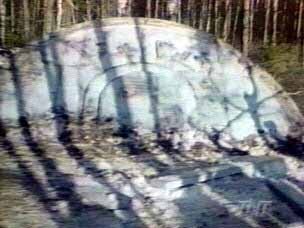 It is: Mysterious Sky-Soviet UFO Phenomenon. Published by PublishAmerica this 408 page illustrated book is available via Amazon. I would like to thank NTV in Moscow for allowing us permission to reproduce this interview and my colleague Paul Stonehill for its translation. Channel 3 Action News report of a Doraville UFO crash incident with actual crash victims. 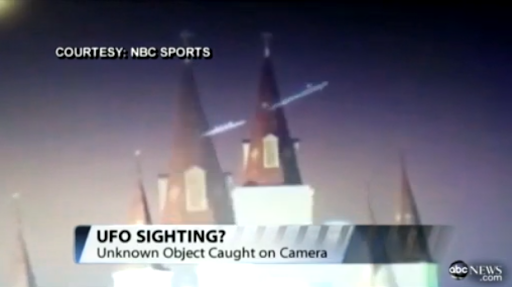 Video cannot be verified and is probably a hoax…but good TV. Glenn, a new visitor sent us the logo for the local action news television station in Doraville (station is actually in Atlanta, Geogia)and it is channel 2 not channel 3 as stated in the video. How does a UFO move? We have been listening and reading about UFOs. Creatures from other worlds have been trying to explore our World. How do they survive? How do they look? What do they eat? How long do they live? What do they look like: they can be in form of particles, mountains or may be equal to size of planets. Life cycle: may be of millions of years or life cycle may be as small for few minutes and get again regenerated in new life without washing out their memories. Growth: Creatures from outside world may remain stationary for years and might moving like mountains and not changing shapes for years. Everyone has own concepts about aliens or external body creatures, I do keep wondering about the movement of these creatures. How do they move, from where they get energy, how they are able to fuel their vehicle for such long distance? I would like to share the concepts I am developing and would like invite questions on it. HOW do they make movement? They work in a team of millions. Together they form a cluster or in form of cyclone. Every individual particle is a living creature. In group energy they move and make a form of UFO. What we term UFO might be made up of millions of creatures, they may take a shape of moving body or desired moving shape which helps in movement. Individual creature or particle having enormous energy might be getting integrated in a group to form a big object. Millions of such creatures get integrated to form a shape, Now questions is how they move? Imagine a atmosphere in front of UFO: where atmosphere is there, there will be nitrogen also. Intelligent creatures capable of liquefying nitrogen will liquefy nitrogen present in front of the object thus creating vacuum in front and resulting in movement of the UFO. Liquified Nitrogen gets accumulated in rear end, this liquefied nitrogen will again evaporate and creature pressure in rear end on evaporation, this will again give thrust to the vehicle to move ahead. This process of liquification and evaporation will help in movement of UFO. This theory becomes practical when the atmosphere is there but what when there is no atmosphere, how does it move. Creature might be converting their own mass into form of energy continuously. 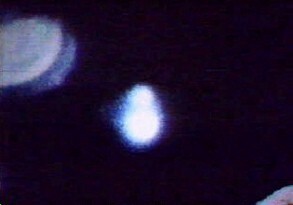 This energy may be utilized for movement of UFO. 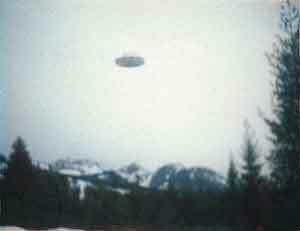 It is possible that the shape of the UFO is continuously changing. This is just like sacrificing bodies to generate the energy. This can be even thought in concept of radioactive material which disintegrates to give energy. I wanted to share this concept to you all; questions are invited to give thrust to creative Imaginations.